Most processed food comes in contact with water in the process of treatment and processing, ANOFOOD® treated water ensures maximum product and production safety without affecting taste or smell. 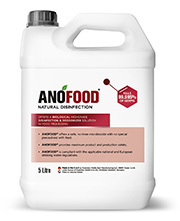 ANOFOOD® offers many opportunities in microbial reduction in food processing, and without affecting organic certification guidelines, and can also be sprayed to prevent mold growth and germ elimination of stored or shelved food products to increase the shelf life of produce. Cooling and storage water, as well as ice, can be treated with ANOFOOD® to maintain disinfection during storage or display with additional odor control. For us clean ingredients are extremely important, and we have gone with ANOFOOD® and are really happy with the results. With a product that happens to be green and free of chemicals, ANOFOOD® has opened new possibilities to meet our goals. As our company handles large volumes of perishables, ANOFOOD® allows us to offer the highest protection during storage and display.